It's not quite half his Order of Merit money, but it's close to it - 150 grand of his current near 350 grand total comes from the final Lewis lost to Gary Anderson two years ago, which explains his very low FRH ranking at number 20, and it's only just number 20 with Darren Webster now barely a grand behind on that metric. Lewis had an alright start to the year, with deep runs to start and end his UK Open qualification, but he would be another big name to fall to Paul Hogan once at the event proper. His next outing would be his only ranking title of the year, which looked like it was going to get him into the Grand Slam until Rob Cross stole his place, with good wins over Michael van Gerwen and Dave Chisnall, but he'd then need to scale things down a bit after back surgery, returning for the Matchplay where he was playing some excellent darts in turning over Steve Beaton, Rob Cross and Alan Norris, before reverting to what he did with incredible consistency in his earlier career, namely jobbing to Phil Taylor. That ended up being close to it for the season - he was in the Grand Prix but lost to Daryl Gurney in the opening round, didn't qualify for the Grand Slam or play enough European events, he did play the last few Pro Tour events, making the final in the last weekend where Rob Cross got his fourth win, and is apparently using a new setup from the Players Championships, where he defeated Mike de Decker and Richard North before losing to Rob Cross. It's the same as ever - when he's playing well his game is incredible, but it's consistency - a nine point difference on the averages when he's winning and losing is too big a gap. His opponent will be one of two players we've seen before - I'll deal with Oreshkin first, who returns after a year's break to make his second appearance. 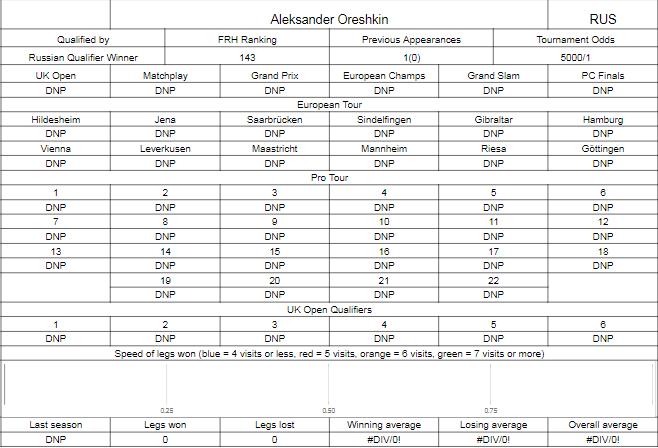 In 2016, Oreshkin won a deciding leg against Paul Lim before giving Mervyn King a big scare, winning the first two sets before running out of steam, the strength of his game being decent outshots and good doubling rather than any real power scoring. He's been part of the Russian World Cup team for the past two seasons, both times with Boris Koltsov who played here last year, and this season they reached the quarter finals, seeing off the Royden Lam/Kai Fan Leung team in round one before eliminating Australia in the doubles, with Oreshkin getting the key singles win over Kyle Anderson. They would get outplayed in the quarter finals by Wales, with Oreshkin winning the only leg against Gerwyn Price, but it's still a very good run out. 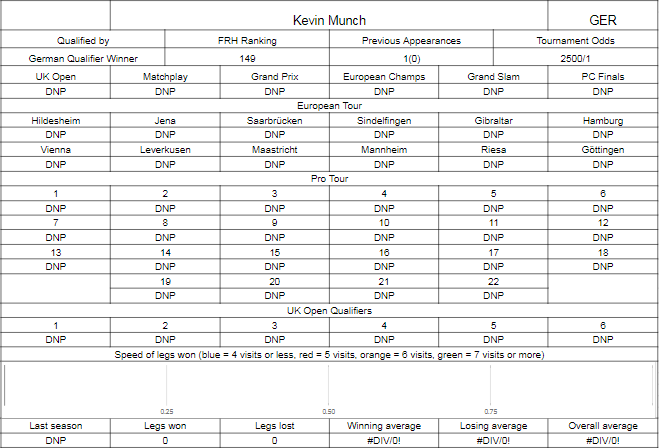 Münch perhaps surprisingly won the German qualifier from their Superleague, as he appears to have dropped a bit off the radar and isn't even playing the European Tour qualifiers, last appearing on that main stage in 2016 where he lost to Jamie Caven in round one, and was whitewashed by Jonny Clayton in his only appearance in 2015. The Superleague, minus Martin Schindler who didn't play the finals as he'd already automatically qualified, and minus Max Hopp, who doesn't play it for reasons unknown, saw the top 8 players from five round robin events play in group stages then knockouts, Münch won through as the second place finisher in his group behind Rene Berndt, but would defeat former Ally Pally legend Rene Eidams in the semi final, and last year's qualifier Dragutin Horvat in the final. It's hard to say what his form is like, he did lose 4-3 in a couple of BDO events in Germany last April to decent players (Hughes, Mandigers) and he only finished fourth in the actual Superleague itself, and you'd think if he was playing OK he'd be playing the European Tour qualifiers. The bookies have the prelim close to evens and I won't touch it as we don't have any real info on Münch outside of domestic play, gun to my head I'd say Oreshkin advances, but it could be close and scrappy. Lewis should have far, far too much quality for either of these, the last time he lost a set in the opening round was when he was defending his second title, and he's not dropped a set in the first two rounds either of the last two years. This is, to the best of my knowledge, the first time two Spanish players have met in the world championships, at least on the PDC side. 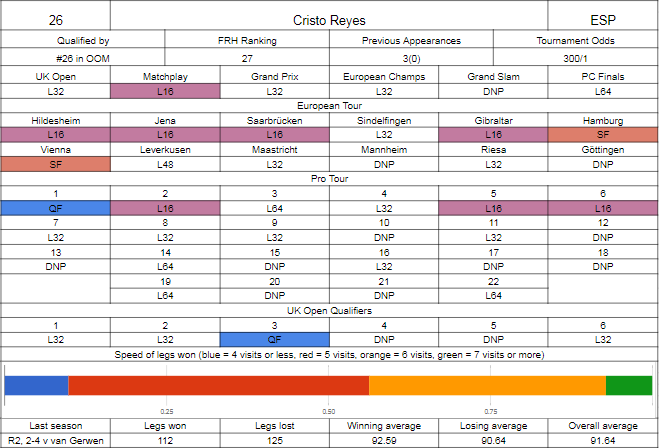 Let's look at Reyes first - he's not had a bad season following his great game this time last year against Michael van Gerwen, but in some ways he's not pushed on to the next level as many thought he might, I certainly thought he could have been top 20 by now. But let's see - his UK Open qualification was solid enough, a good quarter final run being enough to get him straight to the money, where he was the beneficiary of van Gerwen's withdrawal, but he then lost to Joe Cullen in the next round. His start on the Pro Tour was solid, winning his board on four out of the first six occasions, but his floor form would peak with that first event where he made the quarters, and hasn't won his board since then. He had done enough to get seeded to quite a few of the European events, and has had a good conversion rate in turning that into actual cash, with his best runs being a spurt of back to back semi finals in June, beating names including Wright, Bunting, Whitlock and Gurney, before going out to Suljovic and van Gerwen. On TV, he was able to win against a poor Robert Thornton in Blackpool, but that would be his only win - he'd go out to Peter Wright in the next round, lose in Dublin to Benito van de Pas, lose easily in Hasselt to Dave Chisnall, and be edged out by Peter Jacques in Minehead. He didn't get close to either the World Series or Grand Slam, losing very early in qualifiers to Ricky Evans and Jermaine Wattimena, and this downturn in form is troublesome. On the other hand, Alcinas is coming into form at the right time. We remember him from earlier in the decade where he looked useful in back to back World Championships, taking eventual finalist Andy Hamilton to a deciding set in his second shot after losing to James Wade on debut. 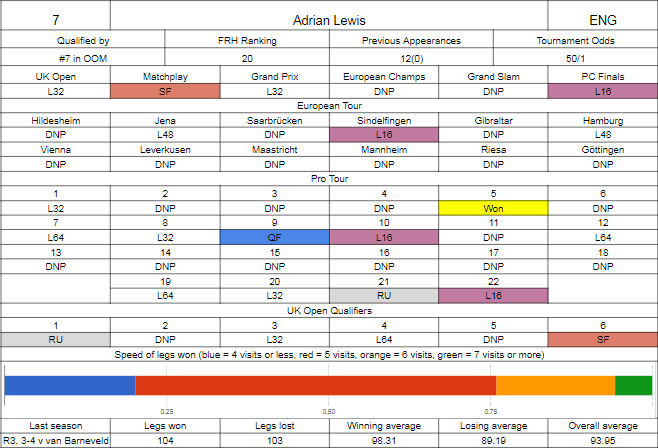 He's looked to return to the PDC stage properly this season, winning a tour card outright on the final day (he was looking very safe regardless), and has played close to a full season. He sneaked into the UK Open on the final day, notably beating Dave Chisnall, but he'd lose 6-4 to James Richardson in the opening round. His strikerate in making European events is pretty poor, only getting into the one in June where he lost to fellow qualifier Marko Kantele, and some of the losses in qualification were surprising - to a Greek that's not John Michael, to a Vincent van der that isn't Voort, twice to Yordi Meeuwisse, although in fairness he's run into Kist twice and van den Bergh. He is at least trending upwards though, two deep runs in the Pro Tour right at the back end of the season got him to Minehead, where Darren Webster would be a step too far. Odd, as on his semi final run he beat the same Webster 6-1. There's two players on opposite form trajectories here. 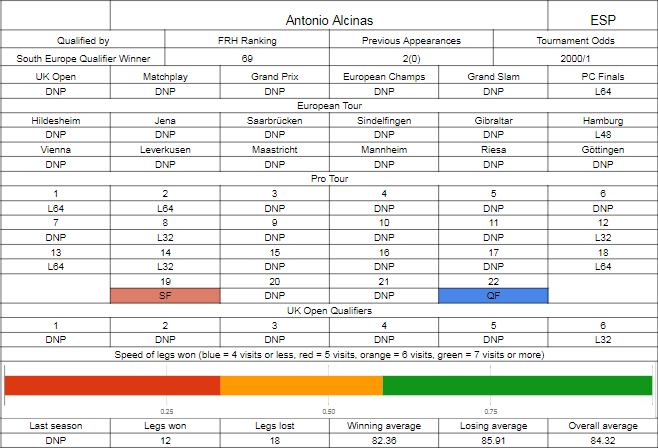 Alcinas has been here before but still needs to get a win, but is seemingly playing better. Reyes has been on a slump for about six months and is without a win on TV since Blackpool, so this could be a bit twitchy if Alcinas can keep it to 1-1. Could be closer than the bookies call and worth an outside punt.